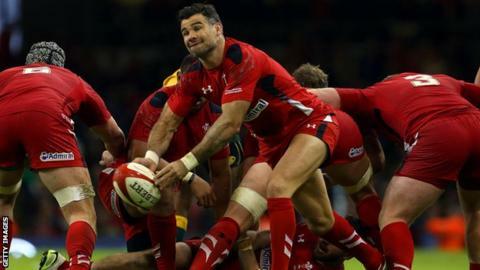 Veteran Wales scrum-half Mike Phillips hopes to reclaim his starting place from challenger Rhys Webb in time for the World Cup. Webb, 25, was chosen ahead of Phillips, 32, for the 33-28 defeat by Australia. But with changes expected when Wales face Fiji on Saturday, Phillips is aiming to force himself into contention with the 2015 World Cup on the horizon. "It's all about goals and we all want to be there [the World Cup]," said Phillips. "It's a massive year of rugby in the lead-up and we have to play well every time we have an opportunity to play for Wales." Phillips and Webb have been scrum-half rivals for years, having played for the Ospreys before Phillips joined French club Bayonne in 2011. Phillips now plays for Parisian side Racing Metro, and has fallen behind Webb in the Welsh pecking order after the latter's excellent start to the season with the Ospreys. "I've been fortunate to start a lot over recent years but Rhys deserved his chance," said Phillips. "I thought he played well. He deserved his opportunity. "I'm a competitor, and I think people know that. I'm a proud man and we all want to play for Wales." Webb made a spectacular start against Australia, scoring the game's opening try after just three minutes. But he also had some moments to forget, such as his long pass which Israel Folau intercepted for the Wallabies' second try. Wales head coach Warren Gatland plans to make a number of changes against Fiji, and Phillips could be one of the beneficiaries if Webb is rested. "It's a great thing to have competition in the squad, and it's a great thing for Wales," said Phillips. "Welsh rugby is in a good position in the nine position." Wales will be expected to win comfortably against Fiji, a team they swatted aside 66-0 when they last met at the 2011 World Cup. But Phillips was a part of the Welsh side which was infamously knocked out of the previous World Cup in 2007 following a 38-34 defeat by Fiji, and knows not to take the islanders lightly. "We all know they're a dangerous team," said Phillips. "We've come up short against them in previous years and last time they played here it was a draw, so we'll have to be on song. "They like an open game and hopefully we can keep it tight."